To the east of the Dayu mountains lies Zhaoling (昭陵 in Chinese), the tomb of Zhu Zaihou (1537-1572, also known as Emperor Longqing), the 12th emperor of the Ming dynasty and his three empresses. Zhu Zaihou ascended to the throne at the age of 30 and die at 36. The Zhaoling tomb was built between 1572 and 1579 and covers an area of 34600 m². It was damaged in the 17th century and reconstructed between 1785 and 1787 under the reign of emperor Qianlong of the Qing dynasty. Several buildings collapsed later and were restored in 1987. 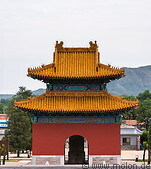 The Zhaoling tomb was opened to the public in 1990.